AgileAdam.com | So many hobbies, so little time. 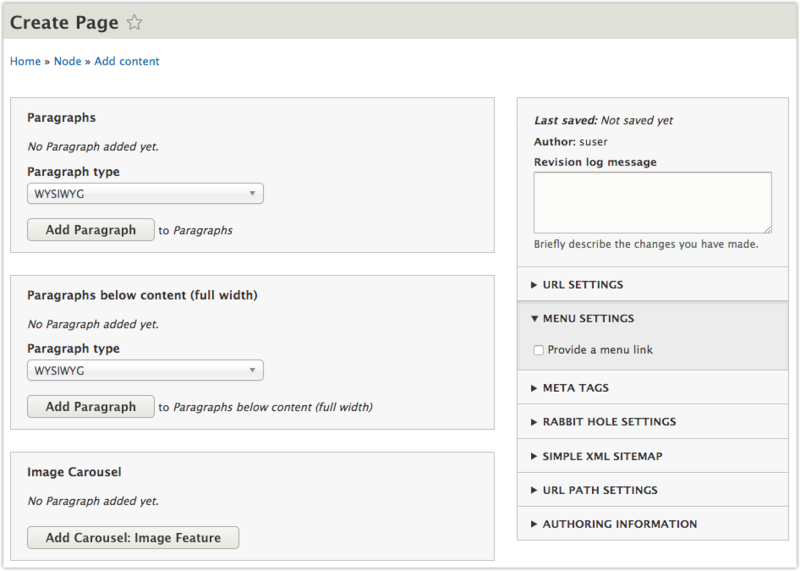 While I prefer using Valet+ for my Drupal development, I have been asked a few times to share my Lando + Tideways setup. I can’t go into too many details at this point, because it’s been a while since I’ve used this, but here’s my setup. I’ve included some documentation within some of the files (especially at the bottom of .lando.yml). You can see some explanation and screenshots of Tideways and Xhgui in my Tideways and Xhgui using Dev Desktop post if you need a bit of an introduction. Also, you may be interested in seeing how I got Tideways running with Valet+. I’ve recently run into an issue where my site (on Acquia Cloud Enterprise) has node displays that were flip-flopping between an older version of a Twig template file, and the most recent version. I tried all combinations of drush cr, varnish cache clearing, and clearing the cache through the Drupal UI. I SSH’d into the production server I always SSH into, and I ran the command as shown. I did this repeatedly. I did a drush cr after. I did a drush cr before. Nothing was working. My pages were showing up with the old template, or the new template, and it seemed to be at random. So, I logged into the Acquia Cloud interface, found the other production server’s connection string (myuser@someserver.prod.hosting.acquia.com), connected, and ran the same command. After another drush cr all of the pages were using the new template. That’ll teach me to jump straight to executing commands without reading the instructions carefully. Please read this entire post (including the disclaimer at the bottom) before you put any of it to use. The site I’m basing this off had an existing set of nodes and a new migration that had the same nodes (and many more) in the data source. I wanted to map the existing nodes to their migration-based counterparts and treat every node as if it originated from the migration. What if the data that you’re migrating (and rolling back if removed) already existed in Drupal before you started using the migration? If you attempt to migrate content, then rollback removed items, you will find that the items that no longer exist in the source will not be deleted if they existed before the migration. First, I should describe how I’m pulling data into existing nodes. And I switch to the iframe "entity_browser_iframe_ifde_media_image_browser"
Then I should see the button "Embed"
When I click "Use existing image"
And I check checkbox 3 in the element "#entity-browser-ifde-media-image-browser-form"
There are a few steps in here that are custom, but explaining them would be beyond the scope of this post; just assume they do what they describe (switching focus to an iframe, and clicking a checkbox). The issue I was having is that every time I wanted to do that one action (pick an image from an entity browser) I was repeating all 8 lines of code. 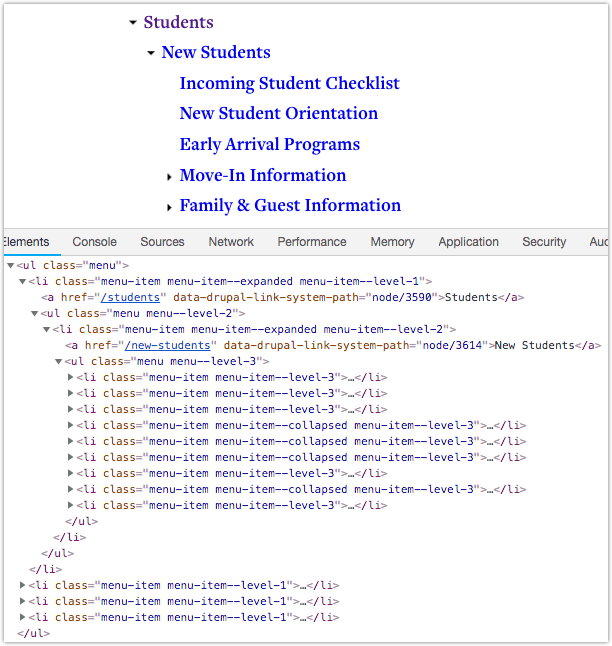 This is a quick post showing how to add level classes to menu items in Drupal 8. Determine which Twig template you need to override. I recommend reading the official docs on this. In my case, for a menu called infofor, I copied docroot/core/themes/classy/templates/navigation/menu.html.twig to docroot/themes/custom/mytheme/templates/navigation/menu--infofor.html.twig . The title of this post could also have been “Opening and Closing a Details Element with Behat” or “Clicking Any Element with Behat”. The Drupal 8 node add/edit screen has a number properties on the right side of the screen. I wanted to use Behat to click the “Provide a menu link” checkbox. On page load this MENU SETTINGS pane is closed like the others. The “URL SETTINGS”, “MENU SETTINGS”, actually mask a <details> element. When I am at "/node/add/page" Then I should see the heading "Create Page" in the "header" region Then I fill in "Title" with "Landing Page without Sidebar" And I check "Provide a menu link"
When I am at "/node/add/page"
Then I fill in "Title" with "Landing Page without Sidebar"
And I check "Provide a menu link"
Unfortunately this results in the failure: element not interactable. When I am at "/node/add/page" Then I should see the heading "Create Page" in the "header" region Then I fill in "Title" with "Landing Page without Sidebar" And I click "Menu settings" And I check "Provide a menu link"
And I click "Menu settings"
Unfortunately this results in the failure: Link with id|title|alt|text “Menu settings” not found. I realized the click step is only looking for links. I updated my Behat code and found success! When I am at "/node/add/page" Then I should see the heading "Create Page" in the "header" region Then I fill in "Title" with "Landing Page without Sidebar" And I click the "#edit-menu" element And I check "Provide a menu link"
The Plain formatter uses a Twig template file but it would take some work to override with the proper markup. The Default formatter doesn’t use a Twig template file so you cannot simply override via Twig. If your goal is to simply hide the country value from the output you can use hook_preprocess_field to alter the country value. As it turns out, unsetting the country field doesn’t help, but setting the value to an empty string does work. Here’s an example (in a module; you can put in your .theme file if you’d prefer the setting to be at the theme level). This post is for folks who are already familiar with PHP, command line, Valet, Tideways and XHGui. You can see some explanation and screenshots of Tideways and Xhgui in my Tideways and Xhgui using Dev Desktop post if you need a bit of an introduction. This doesn’t need much of an explanation. You can use any entity methods as far as I can tell.